Point-and-shoot cameras are stuck in a bad place between smartphones for most people, and mirrorless shooters for people who care more. 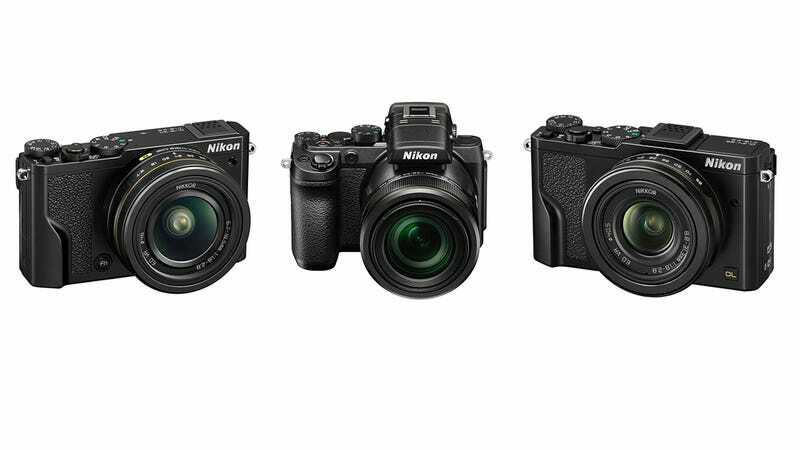 Nikon’s new DL range is hoping to change all that. The DLs all sport 20-megapixel 1-inch sensors, the same as in Nikon’s existing mirrorless cameras. It’s smaller than the Micro Four-Thirds and APS-C sensors commonly found in mirrorless cameras and cheaper DSLRs, but big enough to blow smartphone sensors out of the water. Sensor size is one of those specs that matter: bigger sensors mean more light, which makes for better detail, superior low-light performance, and all-around better performance. The main difference between the three DLs is the lens: there’s one with a general-purpose 24-85mm zoom, a wide-angle 18-50mm zoom, and a superzoom 24-500mm. On paper, those focal lengths look good, but the apertures looks even better: f/1.8-2.8 for the 24-85 and 18-50, and f/2.8-5.6 for the superzoom. Paired with the 1-inch sensor, that should make for fast, non-blurry photos in most conditions. The other specs also point to performance good enough for keen photographers: 4K video capture, hybrid autofocus, a 20fps burst shoot that puts my high-end mirrorless camera to shame, and 1200fps slow-mo (admittedly not at that 4K resolution). Add to that an OLED touchscreen on the back of each camera, a hotshoe to attach an optional electronic viewfinder, and full manual controls, and Nikon might have made the best camera you can fit in your pocket. Unfortunately, you’ll also pay for it. The DL24-85, DL18-50 and DL24-500 cost $650, $850 and $1000 respectively, putting them right up (and beyond) other fantastic point-and-shoots like the Sony RX100. Worth it? We’ll have to wait and see, but either way, it’s fantastic to see Nikon trying to make a photographer-friendly pocketable camera, screw the price.